Fortunately, no Global March to Jerusalem related clashes occurred at the Israeli-Lebanese border in the city of Metula (the small town where I traveled to cover the story for CiF Watch), as had been expected. So, I spent some time at the border location where reporters were stationed conversing with a few of the IDF soldiers assigned there. The conversations with one soldier in particular touched on many topics: some light and humorous (like my difficulties learning Hebrew in contrast with her remarkably fluent, and unaccented, English). But, others were more weighty, such as the cognitive war against Israel in the context of the GMJ, antisemitism, and the politics of the Middle East more broadly. She also told me about her late grandfather’s experience surviving the Holocaust. It was one of the many tales of the suffering and profound strength displayed by those who survived the Shoah most of us have read about, but which, I’ve learned, occasionally possess more meaning in particular times, places and moments in our life. Here I was, a recent immigrant to Israel, blogging about an organized attempt to erode my nation’s moral legitimacy and (if their long-term wishes are fulfilled) our very existence, with a native Israeli whose own life is as improbable as was the rebirth of the modern Jewish state itself. Though estimates vary, the latest research suggests that roughly 1 million Jews died in Auschwitz, a good percentage of whom were children. Many Jews who weren’t immediately gassed died from malnutrition, disease, hideously cruel “medical experiments”, or torture – with most inmates surviving merely weeks or a few months. The late grandfather of the IDF soldier I spoke to somehow survived four years at this Nazi extermination camp. Shortly before liberation, he was sickened by disease and, no longer able to work, was sent by Nazi guards to be killed. However, a Jewish inmate who was working in the camp infirmary noticed that this man minutes away from execution had a number on his arm indicating how long he had survived. Somehow, the physician was able to rescue my friend’s grandfather and brought him into the infirmary, telling him that to survive this long he must be incredibly strong, and promised to do everything in his power to help him recover from this seemingly fatal disease. He did survive and, after liberation, was reunited with his wife, who had survived in France by working as a nurse, passing as a non-Jew. They both soon emigrated to Israel, started a kibbutz and started a family. The young Israeli woman I was sitting with owed her life to her late grandfather’s unfathomable courage, an indescribable will to survive. Much of what inspired me to make Aliyah – and to blog for Zion – was more than a desire to protect Israel, informed by a sober understanding of the malevolence of our enemies. Both were also motivated by a reverence for the heroism of those who came before me, and a desire to honor their memory, those who managed to pass on to future generations the precious gift of continued Jewish existence. I’m haunted by the fear of not being worthy of their sacrifices: the brave early Zionist pioneers who gave up so much and endured physical hardships scarcely recognizable to our generation so that a nation may rise; the Soviet Jews who worshiped in secret, often studying Torah under candlelight, in a nation dedicated to eradicating religious observance, so that their thousands year-old traditions would be passed on to future generations; and the Israeli soldiers who fought and, far too often, died so that their children, and their nation, could live. I am forever in debt to the countless sacrifices of Jewish heroes and heroines over the ages, Guardians of the Jews, for whom words such as valor, determination, duty, and courage (in the face of often impossible odds) weren’t simply vacuous platitudes, but values they lived every day. These brave souls are for whom I blog. As Zionist activists we can never assume that victory is assured, but neither can we succumb to the supremely dangerous vices of cynicism, defeatism, fatalism or resignation. 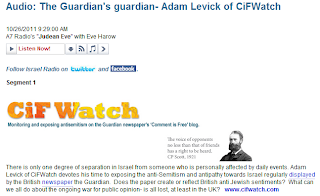 Be it the NYT’s Thomas Friedman, NIF’s Ben Murane, Jonathan Freedland - or even such overtly hostile anti-Zionist voices such as Walt and Mearsheimer or the editors at the Guardian - a common paternalistic refrain from Israel’s obsessive critics is that they don’t dislike Israel at all, but are merely acting out of ‘tough love’ towards a Jewish state which continually pursues policies that aren’t in their own best interest. So, as a citizen of Israel, I respectfully ask my American Jewish friends who see their role as providing guidance to ‘save us from our ourselves’, to please show a bit of humility the next time you provide advice which will result in very real consequences that neither you, nor your family and loved ones, will have to burden. Please avoid the hubris of telling my democracy, continually under siege by state and non-state actors who don’t disguise their malevolence towards us and rejection of our existence within any borders, what kind of risks we should take on the hope that our every peaceful gesture will be reciprocated in kind. Kindly attempt to refrain from decidedly ahistorical assumptions, such as the belief that a cessation of construction in “East” Jerusalem or the West Bank (whatever your views on such communities beyond the Green Line) will necessarily be reciprocated with peace from our Palestinian neighbors. While we appreciate a friendly debate with our diaspora supporters, please understand that it wasn’t diaspora Jews who saved Israel when multiple Arab armies sought Israel’s destruction on the day of its birth in 1948; nor in June 1967 when 500,000 Arab troops amassed along its borders, and Arab leaders assured rapturous crowds in Cairo, Damascus and Baghdad that the Jewish state’s end was near; nor when Arab armies launched a surprise attack in 1973 on the holiest day of the year. It wasn’t diaspora Jews who, in 1976, launched a daring raid to save Jews (Israelis and non-Israelis) held hostage in Uganda, by Palestinian and German terrorists, from execution. It wasn’t diaspora Jews who, in 2002, fought a bloody house to house battle in Jenin – where Palestinians used bombs, grenades, booby-traps and machine guns to turn the camp into a war zone - to root out a terrorist infrastructure responsible for scores of suicide bombings during the 2nd Intifada. And, it wasn’t diaspora Jews who have had to absorb over 12,000 rockets fired from Gaza into Israel since 2002. Like any democracy, Israel not only has a right to defend its citizens, but a moral obligation to protect its men, women and children from ongoing clear and present dangers. The recent Israeli withdrawals from S. Lebanon and Gaza, 63 years of statehood – and certainly much of Jewish history – simply does not support this seemingly immutable belief in the efficacy of the assumption of good will. Yes, we certainly seek (and sincerely appreciate) your moral support in our ongoing battle against enemies waging a relentless cognitive and military war against our nation, and respect those who genuinely empathize with our plight but merely differ with us on how to successfully defend ourselves from such an onslaught. However, we are not children. Respectfully, when engaging in such criticism please attempt to avoid the hubris of believing that you alone possess the sechel, wisdom, and moral understanding necessary for peace which has somehow eluded Israeli citizens, scholars and even the most dovish statesmen for nearly 64 years. After leaving politics, Yosef ‘Tommy’ Lapid, an Israeli journalist, politician and Holocaust survivor (who died of cancer at the age of 77) was appointed to head the Yad VaShem Memorial for the six million Jews who perished in the Holocaust. Six million of our dead speak to us from the earth. ‘We did not think’, they say to us, ‘that such a thing could come to pass. We trusted others’ benevolence…..We believed there was a limit to the madness. BY THE TIME WE AWAKENED FROM THESE DELUSIONS IT WAS TOO LATE. Do not follow in our footsteps. THE ENLIGHTENED WORLD COUNSELS US TO COMPROMISE, TO TAKE CHANCES IN THE NAME OF PEACE. And we ask the enlightened world, on Holocaust and Heroism Remembrance DAY, WE ASK ALL THOSE WHO PREACH AND MORALIZE TO US; What will you do if we take chances and make sacrifices and put our trust in you – and then something goes wrong, WHAT WILL YOU DO THEN, ask our forgiveness. say, WE were wrong, SEND BANDAGES, Open orphanages for the children who survive? pray that our souls rise to heaven? As Lapid asked, and as I urgently repeat, what will WE do if your most stubbornly held assumptions about peace in the Middle East are dead wrong? We have little room for error, and there is no nobility in victimhood. The following was published at The Propagandist, and won first prize in their second annual political essay contest. Ben Murane, an American Jew and head of New Generations for the left-wing lobbying group New Israel Fund, recently wrote an essay, under his blogging pseudonym KungFuJew, titled, "Reinterpreting Jewish communal service". The essay attempts to "reinterpret" Jewish communal service in universal terms and represents the quintessential guilt of liberal diaspora Jews over Jewish particularism. Accused, I was, of not caring enough for those other than Jews…of working only for Jews. Murane has been accused of the sin of working for an organization which focuses primarily on the fate of the Jewish state and evidently felt the need to defend himself from the charge of "selfishness". Instead of turning the accusation back on his interlocutors, and refuting the suggestion that Jews are unique in caring more about the fate of their own community than others, Murane immediately sought to assuage his guilt about being a Jew who cares about Jews. There are plenty Jews in my world of the predominantly young and unaffiliated who are tired of the drumming of “Jew Jew Jew” and recoil from its incessant self-centered, self-referential, selfish concerns. What I abhor about the fight “against” intermarriage is the drive to identify and then root out non-Jewishness to protect us against its invasion. Here, Murane flirts with noxious idea that Jewish particularism is inherently chauvinist, racist, and illiberal, and distinguishes himself from those evidently unenlightened Jewish souls who champion Jewish values, Jewish people-hood, and Jewish survival. Despite the erudition of Murane and his political fellow travelers, they fail to understand that a desire to maintain a distinct communal identity is not exceptional, but the norm throughout human history. People throughout the world, be they Catholics, Hindus, Muslims, or any of the thousands of unique ethnic groups which make up the fabric of human diversity, similarly aspire to maintain their community - to inculcate their children with the belief that their unique culture is worth defending. Judaism is - in its passion to maintain a thousands year old faith tradition - not unique but, rather, the norm, and thoroughly consistent with the ideals of tolerance and pluralism. Israel becomes a place where the ends justify any means because we must secure safety for the Jews first, foremost and instead of all other peoples... a bitter fest of greed to hoard and preserve power for ourselves to share with no one. Then, clearly well versed in the vocabulary of the "multiculturalist" radical left, he denounces "our [Jewish] communal infrastructure" which, has, he says, "become an entrenchment of race and class privilege." Yes, Jews, who make up 2/10 of 1% of the world's population, are a privileged class: a tiny, historically oppressed minority trying desperately to survive is really only the last gasp of a powerful oppressor. The effort then to sort between the Jewish and non-Jewish — be it in ideas or genes — smells of what we learned at the hands of our cruelest rulers in times we’d rather forget. Yes, Jewish particularism as racism. Zionism as the cruel embodiment of everything we suffered under countless antisemitic despots and dictators. Racial supremacy with a Jewish face. I'm sitting here writing this in my home in Jerusalem - a citizen of the first sovereign Jewish state in two thousand years. My wife and I reside in a nation surrounded by politically reactionary terrorist movements who openly seek our destruction, and who quite explicitly express ideas about Jews - and not merely Israelis - which are decidedly racist and illiberal. Yes, of course, my primary concern is to protect my family and friends from those who wish us harm just as Egyptians, Jordanians, Greeks, Germans, Turks, Chinese, Americans (and citizens of the 193 nations in the world) care more about the safety of their own national community than that of others. This recurring tendency of Jews, such as Murane, to pay greater attention to their own moral performance than to the necessities of survival is a trait which Ruth Wisse characterizes as “moral solipsism”. In displaying the resilience necessary to survive in exile, many Jews have come to fetishize weakness, and believe that they could pursue their mission as a “light unto the nations” on a purely moral plane. However, Jewish history has surely shown that such weakness only increased Jews’ vulnerability to scapegoating and violence. Yes, with national sovereignty there is a price that has to be paid in terms of the occasional infliction of human suffering (even if unintentional) that invariably occurs as the result of even the most responsible and restrained use of national power. But in the lives of individual adults, as in the lives of responsible nations, rarely is there the luxury of making choices that will lead to perfect justice for all concerned. Rather, with every serious decision in front of her, Israel must carefully weigh the costs and benefits of various possible acts, and try to make decisions which will likely result in the most positive outcome for the Jewish state - the only Jewish homeland that ever was and ever will be. Unlike Murane, I don’t have the luxury of concerning myself with the fact my fierce and unapologetic determination to defend and maintain a presence in our people’s historic homeland causes some Jews discomfort, or risks alienating us from our "progressive" non-Jewish friends. To those not willing to get their hands dirty by fighting for a Jewish democracy under siege, all I can say is please step aside and let others not as easily tempted by such moral vanity take their place. Finally, I've always been one to strongly argue that the phrase "self-hating Jews" is a misnomer. Jews such as Murane don't hate themselves at all. Such Jews fancy themselves a "brave" Jew - indeed, a better Jew. So, as a lesser Jew, all I can say is that I’d rather be loathed and alive than posthumously loved. You can think of it as the morality of Jewish survival. I was interviewed on Tuesday by Eve Harrow, a long-time community activist and tour guide from the Judean hills, who hosts Judean Eve on Israel National News Radio. On her show Harrow discusses Israeli archaeology and nature, and conducts interviews with Israelis on current events in the Middle East and the Jewish world. The Judean Eve podcast airs live every Wednesday from 3:00 p.m. to 5:00 p.m. Israel time. This was published by my friend Adam Taxin at The Examiner. Tonight, at 7:05 PM, the Phillies will play the first-place Arizona Diamondbacks at what will be not only "Jewish Heritage Night," but, presumably, will be the 200th consecutive sellout at Citizens Bank Park. When I was growing up in Northeast Philly, baseball was not, for my family, simply a pastime. My late father, upon returning home after four years serving in the Air Corps during World War II, pursued his dream of becoming a Major League Baseball player; eventually, he played in semi-pro leagues in the U.S. and Canada, before settling down, marrying my mother, and starting a family. Through the ups and downs of everyday family life, baseball was a passion we all shared. My brother and I played ball in Little League and in high school and – especially through those tumultuous teenage years when fathers and sons are often at loggerheads – no matter what was going on, we could always watch the Phillies together and share in the team’s triumphs as well as their (all too often) defeats. Even now in Israel, I still play a pickup game of softball every Sunday night at a park in Jerusalem with a bunch of fellow American olim [emigres]. However, although my aliyah [move to Israel] has been everything I hoped it would be – as I met the woman of my dreams and am now married, and I have an incredible job advocating for Israel – without question, the worst part of being in Israel (other than, of course, missing my friends and family) is not being able to anywhere near the 2011 Phillies, perhaps the greatest team, and certainly the greatest pitching rotation, in franchise history. The time delay here makes it difficult to watch many games, and viewing it on MLB.com just isn't the same. I miss the ballpark, the smell of the grass, the excitement of the fans, the sound of the crack of the bat, and Crab Fries from Chickie’s and Pete's. I love Israel with all of my heart, yet my affection for America has not waned; nor has my passion for the Philly team to which I’ll forever be loyal. We’re spending Shabbat with friends in Kochav Hashachar, a national-religious community of 300 families, comprising Kochav Hashachar itself, Maaleh Shlomo and Mitspe Kramim within the jurisdiction of the Mateh Binyamin Regional Council. The population is roughly 1,500. 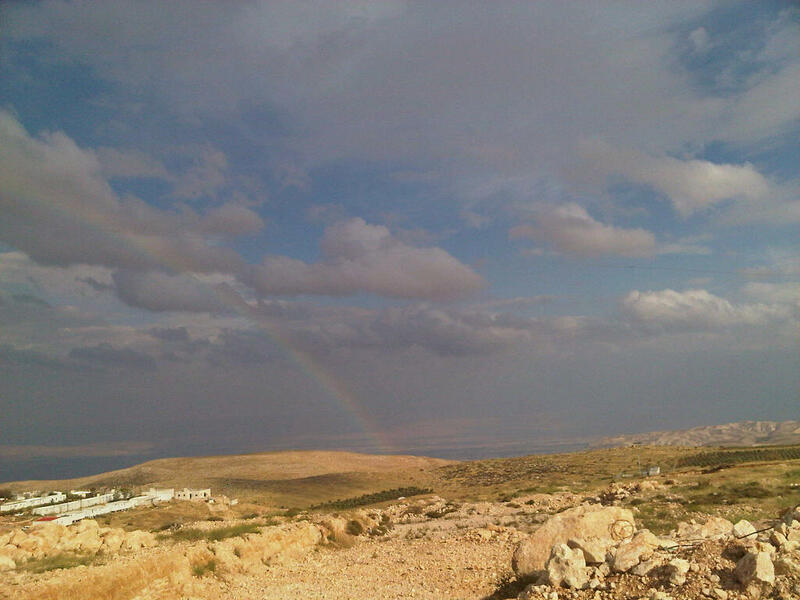 Kochav Hashachar is located on the “Allon Road” some 18 miles North of Downtown Jerusalem. 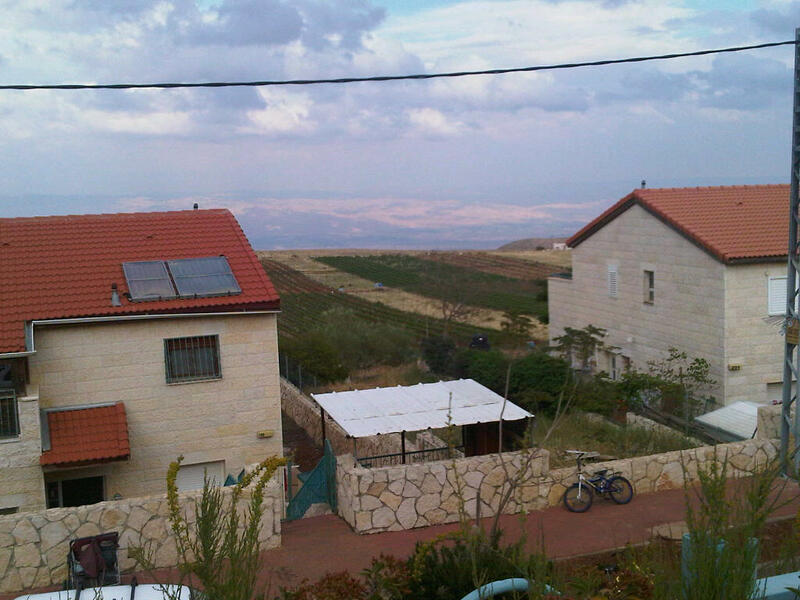 The yishuv is situated toward the Eastern edge of the Judea-Samaria Mountain Range, overlooking the Jordan Valley. We’re staying with the Rabbi and Rebbetzin (and their four children) who mentored my wife on her journey to a more religiously observant life. Though Rabbi Hillel is from the US, and his wife Aliza, is from South Africa, they met in Israel after making Aliyah and only later returned to the town of Port Elizabeth to serve as the community Rabbi for the town’s dwindling Jewish population. I’m sitting on a quiet hill overlooking vineyards – grapes grown in Kochav Hashachar are purchased every year by Carmel Mizrachi for their red Fantasia Sparkling Wine – and, beyond that I can see the Jordan valley. Israelis who live in communities beyond the green line differ in their motivation. Some are secular and others religious. Some are ideological and others motivated by the religious significance of Judea and Samaria in the context of Jewish history, and yet others induced by more practical reasons such as the lower cost of living relative to the major urban areas. Still others find comfort in small town life, where they know all of their neighbors, and where parents feel safe allowing their children play and roam within the community. What strikes me also about life here is the quiet, the stillness. Occasionally when I read accounts of life in such Moshavim in the Guardian, the words I read conjure pictures of a place which seem to represent not life as it is, but life as a parable – stories and fictive illustrations in the service of satisfying popular and conventional mores. I often wonder whether what many in the affluent, post-nationalist West find so alien about Israelis, particularly those who have settled across the green line, is their passion for place, the reverence we possess for this particular place over all others – an apt illustration of the failure of many to understand Jewish particularism more broadly. To discriminate, in the positive sense of the word, means to distinguish accurately; to elevate some places over others. To discriminate means to choose. When you choose to identify with a particular religious community, you choose that faith and that community and not others. When you marry, you choose your mate over everyone else. Residents here have chosen Kochav Hashachar over all others. The entrance to the house where the Fogel family lived – until the brutal attack which consumed the lives of Udi and Ruth, and three of their small children – is still decorated with the note joyously announcing the recent birth of Hadas who, at three months, was the youngest Israeli victim on that fateful Shabbat evening. I don’t entertain notions that my brief time in the Israeli Yishuv called Itamar, and conversations with the community Rabbi, Moshe, and his wife, Leah, could possibly provide a full picture of what life is like in this community of 1,000 – the vitality, nuance, and day-to-day rhythm which only those who call the place home can ever really accurately describe – but one thing is for certain: While reasonable people can certainly disagree on the broader social and political implications of such communities across the green line, as with so much of what passes for reporting from Israel, the frequent and, at times, horribly callous pejorative depictions of those who choose to live here have almost no resemblance to reality. In listening to Moshe and Leah – who, in their late 40s, are young grandparents – speak of Itamar, the Yishuv that’s been their home for 27 years, what they quite emphatically spoke of was not enmity towards the perpetrators of the grisly attacks on Friday, no calls for revenge, but simply their love for their country, the spiritual significance of the area (Itamar lies very close to Schechem, where Joseph was buried), and their belief in their right to live there, consistent with their desire to live in a Torah-observant community. “Hard-line”, “fanatical”, and “extreme” – language carelessly, and lazily, employed in the service placing the rich, nuanced, complicated and passionate lives of the residents of Itamar in a way conveniently consistent with one’s political edifice – represents nothing but dehumanizing hyperbole, and serves often to assuage the empathy and natural inclinations towards moral outrage over the suffering of “the other”. Such words are often little more than name-calling, malicious invectives masquerading as journalism and polemical meditation. One of the common questions – or, more accurately, political litmus tests – most frequently posed by acquaintances back in the U.S., since I moved to Israel, is how I feel about the “settlers”. Though I really never had a short and pithy reply for my interlocutors, I’m certainly now prepared to give a sincere and honest, though far less than exhaustive, answer: They are more than political abstractions and, whatever my thoughts about the decision to build and expand such communities, I will not be party to their demonization. They are, simply, fellow citizens in the nation I love, and the place I now call home. My initial skepticism over the objectivity of your multi-part drama to be aired on British TV which, as you say, strives to "come to an understanding of the most dangerous and intractable war of our age...the conflict between Arab and Jew in the Middle East", called The Promise, seems warranted now that I've read your introduction to the film printed in the Guardian on January 28th. "Israel is isolated, loathed and feared in equal measure by its neighbours, finding little sympathy outside America for its uncompromising view of how to defend its borders and secure its future." "How did Israel squander the compassion [derived from the horrors of the Holocaust] of the world within a lifetime?" Actually far from being isolated, my country is actually more economically entwined with Europe than we've ever been - the story of a tiny nation with little in the way of natural resources outperforming not only its neighbors, but some larger European nations as well. That Arab countries on our borders don't wish to share in our relative prosperity, that 62 years after our birth those same Arab states continue in their self-defeating (either de facto or de jure) economic boycott of our country is not a reflection of our values, but rather of theirs. In nearly every measurable social, educational, and economic category, my country often wildly exceeds the performance of our oil rich neighbors. That my Israeli passport makes me persona non-grata in most of the Arab world is an indictment of their intolerance, their intransigence, their bigotry, not mine. If by "loathed", perhaps you're referring to the fact that 90% of the Arab world have an unfavorable opinion toward Jews? That is, empirical evidence demonstrates that the overwhelming majority of Arabs are openly not just anti-Israel, but wildly anti-Semitic - polling data which is thoroughly consistent with the evidence of state sanctioned Jew-hatred documented continually, yet frequently ignored by those who see such facts as inconsistent with their predetermined conclusions. While the overlap between anti-Israel sentiment and outright anti-Semitism in the rest of the world is a bit more complicated, in our region the data proves that the two are quite simply one and the same. That copies of the Elders of the Protocols of Zion sell briskly on the Arab street, that conspiracy theories about Jews being responsible for 9/11 are popular, and that state-owned newspapers in Egypt, Syria, and Saudi Arabia continue to publish cartoonsportraying Jews as hideous, treacherous, bloodthirsty villains is not a reflection on me. It is an indictment against them, their culture, and their values. The notion that my democratic Jewish state is feared would almost be comical if it wasn't so dangerous. Tell me, Mr. Kosminsky, were we feared when six Arab armies sought our destruction on the day of our birth in 1948? Were we feared in the weeks prior to June 1967 when Arab leaders were telling roaring crowds in Cairo, Damascus, and Tripoli that the the annihilation of the Jewish state was near, or when those same leaders conspired with the Soviet Union to launch a surprise attack on us six years later on the holiest day of the year? Have all the civilian casualties and human carnage we've suffered as the result of suicide bombings and rocket fire in the years since those full-scale attacks indicated to you that we are feared? What you characterize as fear may simply be something more akin to a grudging acceptance by our enemies regarding our resolve, our steadfastness, and our will to survive despite their enmity - not a commentary on our villainy. That Jews - who have but one state to call their own, and who represent 2/10 of 1% of the world's population - inspire fear in others is again not proof of our sins, our phobias, our behavior - but is a window into the soul of those who allow themselves to believe the most ludicrous, and historically lethal, Judeophobic calumnies. As a citizen of the country which you now claim expertise, I can assure you that I don't seek the compassion you audaciously claim we squandered. I have no need for your sympathy, and I don't require your affirmation. Our national right to exist, my rights as a citizen in the national homeland of the Jewish people, is not suspended in mid-air awaiting your approval. I refuse to give you that power. To the degree to which my stubborn refusal to allow you, and others, the right to pass judgment on my merit may inspire fear, loathing, and isolation, I'm okay with that. I'd rather be alive and hated than posthumously loved. 15 seconds. As I noted in my post yesterday, that’s the time Israelis who live within reach of Gaza rockets have to take shelter from the moment the civil defense sirens wail. 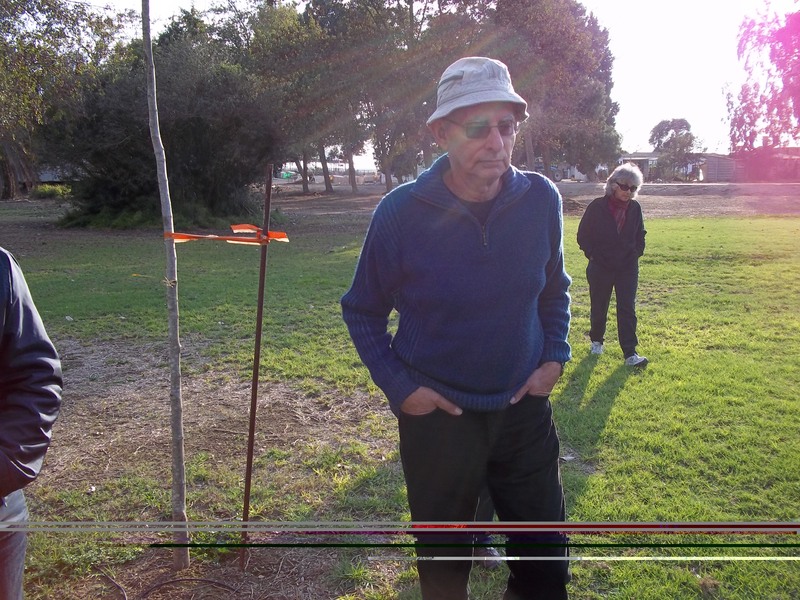 However, while touring Kibbutz Nahal Oz, the site of Saturday’s mortar attack, we learned that such projectiles (as opposed to rocket fire) aren’t detected by Israeli monitoring devices, leaving residents absolutely no warning before impact. Dov Hartuv, a long time resident of the community, came to Israel forty years ago but, by his own admission, his native South African accent hasn’t diminished a bit. Nahal Oz was first founded by a group of soldiers who served in the “Nahal” Israeli army unit opposite Gaza, in 1953. 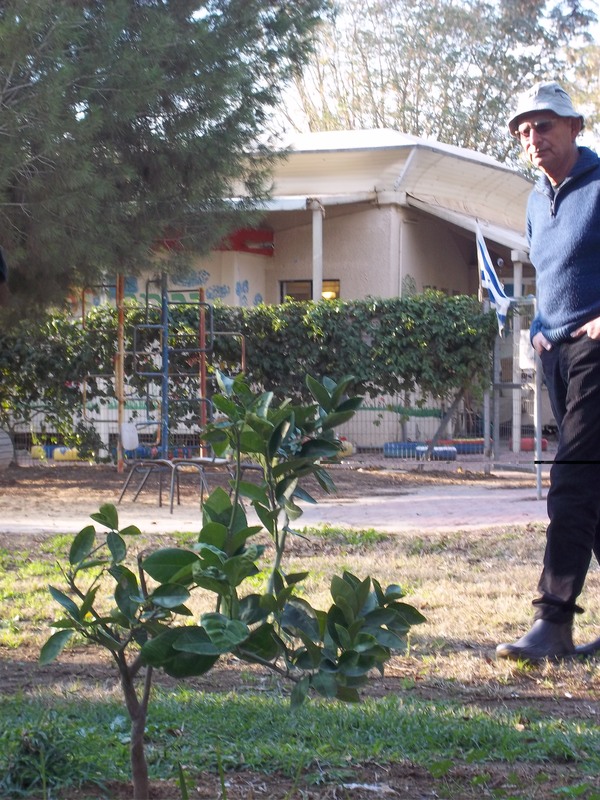 The Kibbutz has had its ups and downs, and the current danger posed by rocket fire from Hamas is seen in the context of previous threats they’ve lived through over the years. During the first fourteen years – when Gaza was controlled by Egypt – Nahal Oz suffered from artillery shelling and mines planted in their fields. (Parts of the kibbutz fields straddle Gaza.) There were also many border infiltrations during that period. Four members of the kibbutz were killed during the first few years of the new settlement, Dov told us. 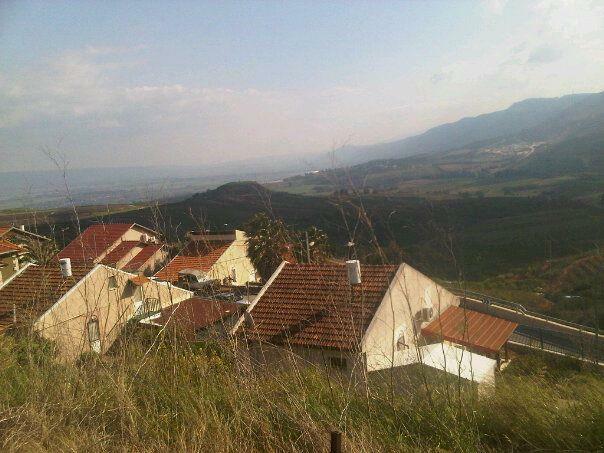 The population of Nahal Oz consists of 360 people, including members, children and residents. Since its founding, many soldiers have settled on the kibbutz and raised a family after their army service. The kibbutz has also absorbed many families from the city, new immigrants from Russia, Argentina and the U.S. The young men and women from Thailand who work at Nahal Oz do so because, despite the fact that their salary and accommodations are modest, they still earn enough to send money to their families back home. 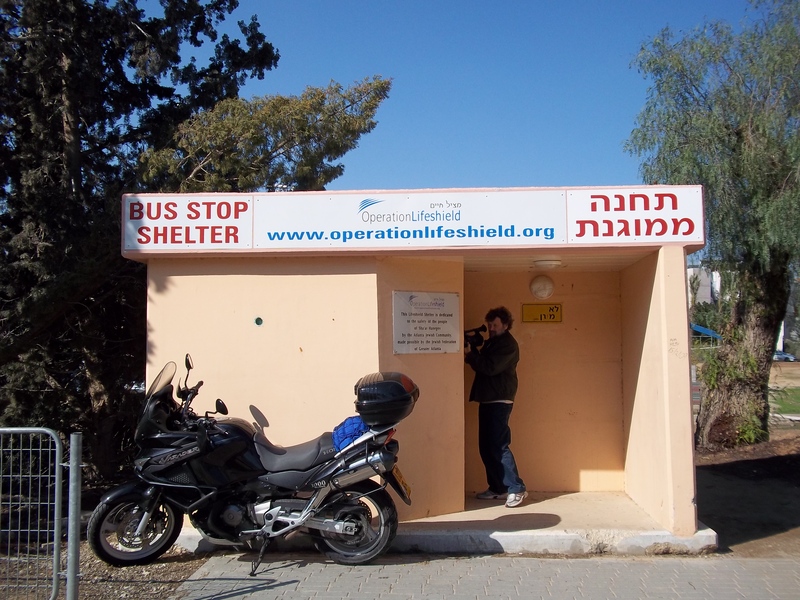 Dov spoke of the risks of living at Nahal Oz with a sobriety consistent with most of those who I spoke with that day – Israelis not governed by fear, but also not blind to the very real dangers they, and their families, face. He, like the overwhelming majority of those who call Nahal Oz home, is fiercely secular – the community is currently debating the suggestion by one resident to build a synagogue – but also fiercely protective of the kibbutz (and Zionist) values which brought him to Israel in the first place. Like the overwhelming majority of Israelis on both sides of the political spectrum, residents of Nahal Oz are proudly nationalistic. 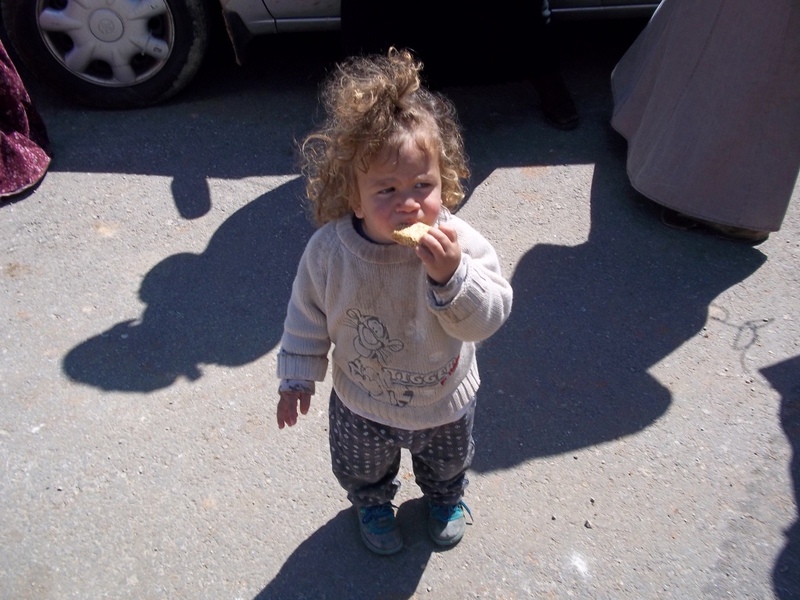 Though burdened with risks which most in the West will never have to face, they have no interest in evacuating to safer ground, and have no doubts about their right to live where they wish in the Jewish homeland. 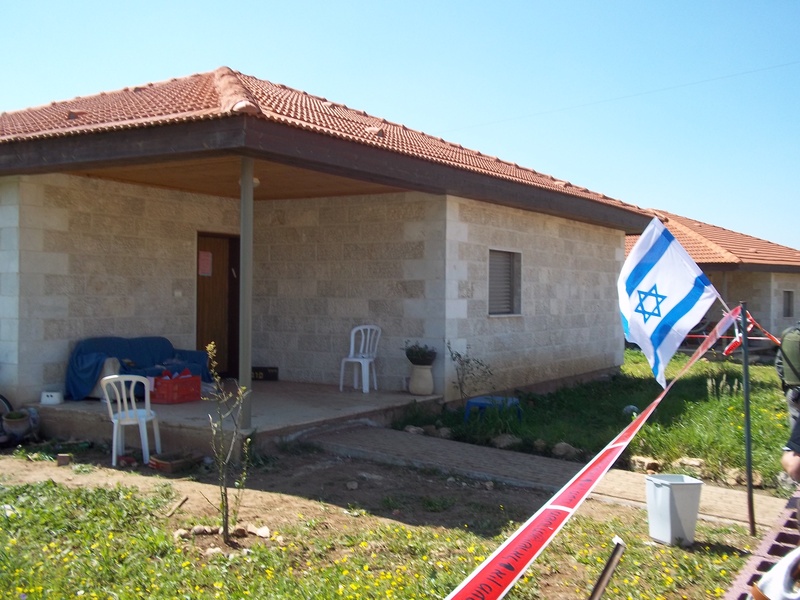 In September, a rocket fired from Gaza landed just across from the kibbutz kindergarten (picture right). As is the custom at Nahal Oz, a tree was planted at the precise location where the rocket landed – as a symbol that their pragmatism is always balanced with an inextinguishable hope for a peaceful future. While on a tour of Israeli communities along the Gaza border, I had the opportunity to visit an elementary school on the front line of Hamas’ war of terror. The close distance between the school, located in the Sha’ar Hanegev region of Israel, and the Gaza border left it extremely vulnerable to Hamas rocket attacks after the Iranian backed group came to power in 2006. As such, students at the school have had to cope with red alert sirens and bomb shelters as an everyday part of their childhood. Once the siren wails the children have about 15 seconds to run to the nearest bomb shelter - the approximate time between the siren and the time an incoming missile would strike. Before Operation Cast Lead, this consisted of a staggering 30 to 50 such “events” per day. After the war, such incidents are more rare, but still represent a consistent part of their elementary school life. And, as Israelinurse has reported (but all but ignored by the Guardian and most of the MSM), the situation along the Gaza border has been slowly deteriorating. For instance, in April there were 5 rockets (or other live fire) launched from Gaza into southern Israel, while in December that number rose to 51. Anat Regev, the school principal, told us that the school’s buildings were recently reinforced to make the roofs less vulnerable to rocket strikes. While touring the school grounds, we had the opportunity to speak to a few of the children. Dan, pictured below, is 12 but had an air about him which made him seem quite older, perhaps touched by the world-weariness that most don’t acquire until well into adulthood. His mother was killed 2 years ago in an auto accident and his father, a medic, was a first responder to Saturday’s shelling of Kibbutz Nahal Oz, not far from the school, which injured three Thai workers, one who is still hospitalized. Dan is periodically plagued with nightmares, especially in the immediate aftermath of such attacks, but – perhaps driven by a child’s fascination with the macabre – rode his bike to the site of the attack at Nahal Oz, to see “the blood and destruction,” before being told by his father to return home. Dan told us that the time when he’s most afraid is when he’s neither at school or home – thus, not in close proximity to a bomb shelter – and must respond to the wail of the the civil defense siren by simply laying on the ground face down, with his hands covering his head. Those few seconds, before the all-clear siren sounds, are, Dan suggested, not so much by his words but more by his expression and demeanor while relating the story, are the most terrifying. How many enemy rockets were fired into your country this week? If your answer is "None", then you're not a citizen of Israel. Far, far from the attentions of the analysts and the reporters and the photographers and the editors and sub-editors, some 30 rockets and mortars were fired into Israel from Gaza in this past week. The following map illustrates our country's vulnerability in the event a future Palestinian state becomes overrun (as in Gaza) by Hamas, or other extremist elements, and acquires an arsenal od Katyusha rockets. This is something I humbly ask that you consider when meditating on Israel's reluctance to withdraw from the West Bank. Instead I’ll focus on Jay’s broader points he makes about race, culture, and determinism. I won’t address every item, simply the broad themes in his reply I deem as worth exploring. First, it may not mean “nothing”, but it doesn’t appear as if you explain precisely what it does mean? What does “a nation of a European colonizing culture” mean? What is its significance? Are Americans to be divided into those descending from colonizers vs. those descending from the colonized? Is there not, a huge distinction, in your mind, between, a protestant immigrant from England and a Jewish immigrant who escaped Poland in the 1930s? Does one inherit the sins of his fathers? And, if so, does one also inherit the achievements of his fathers? If so, don’t we also, as European Americans(whatever that denotes to you), also inherit the noble sacrifices of our ancestors which defeated the twin totalitarian movements in the 20th century – fascism and communism? Why do many on the left who mock the notion of “American Exceptionalism” – the inherited mantle of the grit, determination, and unimaginable sacrifices made my so many Americans in the service of the successful battles against the totalitarian movements, her contribution to the spread of democracy around the world, and civil liberties and economic prosperity that would have seemed simply unimaginable to generations of men and women throughout history – seem so eager to accept the inherited guilt of a people who, admittedly, also colonized and enslaved? Further, while I don’t deny that, if my father were of Kenyan background, I’d likely see Churchill much differently, let me ask: do the descendants of “colonized” African people also inherit their own ethnic/national legacy of brutality, misogyny, and oppression against one another? (You wouldn’t deny, would you, that even historically colonized people have their own history – prior to, and after, colonization? You, further, wouldn’t deny, would you, that they possess moral agency, and can’t possibly be reduced merely to the sum of their experiences with European colonizers? You seem, in certain passages to admirably reject the rigid categories of post-colonialism but, in others, seem to accept them – at least in your understanding of the West’s (and the America’s in particular) relationship with those previously colonized. Post-colonial ideology, in its essence, assigns quite arbitrary, and static, moral labels – and represent s an intellectual paradigm which, in my mind, has, more than any other political dynamic, eroded support for, and confidence in, the Western world (not to mention, Israel) among progressives. Such an ideology (what Pascal Bruckner terms “the tyranny of guilt”), which sees the world through this facile, and seemingly immutable, oppressor vs. oppressed paradigm, I fear, also has the deleterious effect of sapping the moral confidence of the U.S. – a confidence which will be desperately needed to fight the scourge of radical Islam and any subsequent totalitarian movements which may emerge. I once read that Churchill’s greatness lie in his ability to inspire the British people to see themselves as courageous as he saw them. That is, though the British people were compromised – as all people are – with historical moral failings and human frailty, Churchill understood that he couldn’t rally a nation to defeat the existential threat posed by Nazism which was plagued by self-doubt and guilt. Beyond this emotional reality – the human tendency to “discriminate” in the positive sense of the word (that is, to choose one from another) however – it is also a fundamental rational truth in the political realm that merely because every nation thinks that it is great, doesn’t mean that it is, in reality, so. This seems to be the fundamental argument of multiculturalism – this stubborn refusal to acknowledge that not all civilizations are indeed equal. Some have produced exceptional cultures, governments, and economies, and others have not. Is this even debatable? I love my wife as I love my country – not uncritically, but unconditionally – out of passion, loyalty and reason. Finally, while Obama may have a view of Churchill (based, perhaps, on his ancestry) that isn’t in sync with mine (I have a paperweight on my desk which quotes Churchill: “never, never, never give up” as an inspiration for me personally, and for me as an Israeli, a citizen of a nation who stubbornly refuses to surrender to its enemies. ), I hope you would agree that the truth or falsehood of ideas (or the merit of one’s achievements) have nothing to do with their racial, ethnic, or religious origins. The mantra (epithet) of the “Dead White Male” back in college – used to describe what the multi-cultural set thought was the inherent irrelevance of the Western classics (in literature, philosophy, etc.) due merely to the color or gender of the author - has always struck me as, at the very least, ad hominem, and inherently anti-intellectual. The notion that we are, at the core, more than sum of our racial, ethnic or religious identities; that human nature is universal; that the insights of Sophocles, Shakespeare, or Thomas Hobbes into the challenges of the human condition are as relevant to a boy with Jewish Eastern European parents growing up in Philadelphia as they are to a kid who grew up in Hawaii, Indonesia, and Illinois to a Kenyan father and a white European mother are profound and important truths. They are, also, it seems, quintessentially classical liberal notions – and, yet, fundamental truths which many on the left seem to have tragically abandoned. My time in Iraq has come within the 7 day mark and today I was surprised by a medal ceremony. We went to a place called "Heroes Highway" which is the tunnel through which the medivac (helicopter) patients are brought through when they land outside the hospital enroute to the ER. Because the troops come in on their backs they lined the top of the tunnel with a huge American flag so it is the first thing they see before are wheeled into the emergency room. When I did medivac from Kirkuk I and passed through the tunnel I was always too intent on getting the patient to the ER to notice the symbolism of "hero's highway" which is where a huge portion of those killed and wounded here have traversed. In any event I was called "urgently" to heroes highway for a "medical emergency' and found the command staff waiting for my arrival. I was somewhat confused when Col Lawrence (blonde woman in the pictures) said "Major Lobl, you have done a great job here and we want to acknowledge the tremendous work you have done for our troops." She presented me with the Iraqi Campaign Medal and the Air Force Expeditionary Service Medal. She then said that because of my "volunteer" forward deployment to Kirkuk and because my medivac (army helicopter) combat flights were unique and "above the call of duty" the 332 Medical Group (the med side of Joint Base Balad.) had submitted my name for the Air Force Achievement Medal which was approved by the "president" and was now at my home unit awaiting my return at a ceremony to be given at my home base. Although I am under no illusion that I have done anything close to the troops who are here longer and spend more time outside the wire (defending me as I am generally helpless if attacked) it was quite an emotional experience standing under heroes highway surrounded by my friends and the brass and receiving the medal. I felt tremendous happiness that the ceremony occurring meant my time here was coming to a close so I can go back to my beloved Pittsburgh to see friends and family. I felt some sadness that I would never in my life unite with all these awesome people at the same time. 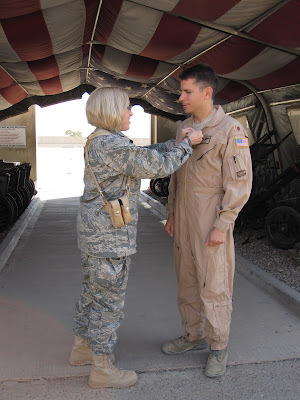 I felt some trepidation about (as a reservist) going from an environment with unique bonding over a shared experience to a decidedly non-military community where my experience here would be extremely unique. But most specifically I felt privileged to have been able to be given the opportunity to care for our soldiers and work with some of the most selfless team players I have met in my lifetime. It really is a thrill to serve our country. Political cartoons often have more of an immediate impact in reinforcing negative stereotypes about Jews than a lengthy essay. By far the largest output of anti-Semitic cartoons nowadays comes from the Arab and Muslim world. A yet uncharted field of hate cartoons against Jews is that in progressive blogs. Anti-Semitic cartoons found - and seemingly tolerated - on progressive blogs such as Daily Kos, MyDD, Mondoweiss, and Indymedia are mainly expressions of anti-Israelism, a more recent category of anti-Semitism than the religious and ethnic-nationalist versions. Traditionally the core motif of anti-Semitism is that Jews represent absolute evil. The cultural notion of what that means has changed over the centuries. Nowadays absolute evil is often expressed as Jews or Israelis being Nazis. Indeed, the cartoon motif most frequently appearing on the progressive blogs is imagery equating Israel with Nazi Germany. Others reflect Jewish conspiracies, Zionists controlling the world, the blood libel, or show Jews as animals. Most of the progressive blogs discussed, containing such anti-Semitic imagery cited in this essay, generally fail to remove such hateful cartoons, despite blog policies expressly prohibiting posts that contain "hateful" or "inflammatory" content. Cartoons have to express ideas in an easy-to-understand way. Therefore they are often accessible even to people who cannot read. Cartoons are also an efficient way to transmit hate and prejudices, including anti-Semitism. Anti-Semitism in cartoons has been investigated, among others, by the Belgian political scientist Jöel Kotek in his book Cartoons and Extremism. Political cartoons often have a more immediate impact in reinforcing negative stereotypes about Jews than a lengthy essay. The largest output of anti-Semitic cartoons nowadays comes from the Arab and Muslim world. Outside it one also finds a significant number of anti-Semitic cartoons in many countries. In Europe, for instance, over the past decade such imagery has been particularly strong in countries such as Norway and Greece. A yet uncharted field of hate cartoons against Jews is that in progressive blogs. They are mainly expressions of anti-Israelism, a more recent category of anti-Semitism than the religious and ethnic-nationalist versions. Traditionally the core motif of anti-Semitism is that Jews represent absolute evil. The cultural notion of what that means has changed over the centuries. In current times absolute evil is often expressed as Jews or Israelis being Nazis. This charge is usually identified with the virulent anti-Semitic cartoons on right-wing extremist sites and in Arab media. This motif, however, is also the main one found in anti-Semitic cartoons on progressive blogs. Also the three major submotifs of anti-Semitism are expressed in cartoons on progressive blogs. The first one is that Jews lust for power. In progressive blogs this is manifested mainly as caricatures on Jewish conspiracies and Zionists controlling the world. The second major anti-Semitic submotif is that Jews lust for blood, and progressive blogs include cartoons accusing Jews of infanticide. The third anti-Semitic submotif, namely, that Jews are inferior beings, is expressed on these blogs in cartoons showing Jews as animals. The cartoonist most frequently appearing on the progressive blogs analyzed here is Carlos Latuff. He is an extreme left-wing political activist who won second place in the notorious Iranian Holocaust Cartoon Competition. Latuff is one of the more prolific anti-Semitic cartoonists on the web, with a staggering amount of work dedicated to advancing explicitly anti-Semitic political imagery. See the rest of the essay, here.